The Jaguars will waive safety Barry Church, according to Ian Rapoport of NFL.com (on Twitter). In related moves, the Jags also waived tight end Niles Paul from the NFI list and activated offensive lineman Josh Wells from injured reserve. 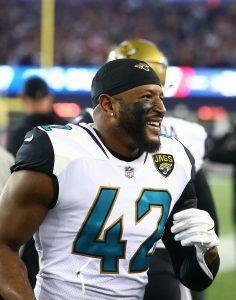 Church, 30, joined the Jaguars prior to the 2017 offseason on a four-year, $21.6MM deal. His guarantees have already been paid out, so the move will have no impact on the Jaguars’ 2019 cap. Church’s release will free up $6.25MM in 2019 and its expected that there will be more cap-clearing cuts in the coming months. The veteran was a healthy scratch last week, but the move to release him before the end of the season is a tad surprising. In any case, Church will hit the waiver wire, giving teams 24 hours to claim him. In theory, a team could be on board with paying him game checks of $368K for the rest of the year before releasing him from his deal in the offseason. However, the more likely scenario is that Church will go unclaimed and then sign with a contender for the rest of the way. In eleven games this year (all starts), Church has tallied 38 tackles, one sack, and one interception. However, he has been generally poor in coverage and ranks as Pro Football Focus’ No. 79 safety out of 83 qualified players. He was far sharper in 2016, his final year with the Cowboys, and 2017, his first with the Jags. Wasn’t he one of the players that got booked in London? Clearing his money from the books helps a ton, but it also wouldn’t surprise me if Coughlin will start to overhaul the roster and get rid of anyone that could be a problem in the locker room. Church probably in the wrong place at wrong time stand up guy and leader in Dallas and would love to add him for depth. Wouldn’t be surprised either if he was brought back. I guess there is no faith in the Church when all your prayers for a winning season go unanswered.